MA in Visual Criticism (2002) California College of Arts and Crafts, San Francisco, CA. Coursework in 3D Modeling and Animation (1995) Academy of Art College, San Francisco, CA. BS in Computer Systems Engineering (1993) Howard University, Washington D.C.
Goldberg has been writing about culture and technology, with varying emphasis on issues of race and class, since graduating from Howard. His reviews have appeared in a number of journals and publications including CameraWork Journal, Afterimage and Art Pages. Hawai‘i’s local daily and weekly newspapers have welcomed his writing on the arts, culture and technology. Local and national arts institutions continue to invite him to write catalog essays for artists whose work walks along the borders of art, technology and popular culture. 2012 – Catalog Essay: "Six Artists Pursue the Art of Re-recognition in the Deserts of the Real," Honolulu Museum of Art Biennial X. 2012 – Catalog Essay: "Katamari Poitics and Alien Heroics," for Aaron Noble, Los Angeles, CA. 2011 – Essay: “An Open Letter to Carlos Villa,” in “Carlos Villa: The Integrity of Spaces” ed. Theo Gonzalves. 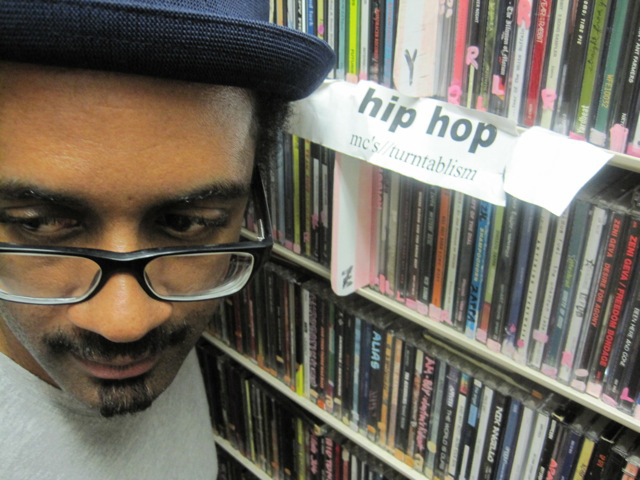 2011 – Catalog Essay: “” for Kamau Patton. Yerba Buena Center for The Arts, San Francisco, CA. 2007 – Feature: “Meditations on an Art Scene,” “U Magazine” Honolulu, HI. Between and during semesters, Goldberg has delivered focused presentations of his research to a wide range of audiences, most often on the public borders of various universities across the country. His lectures serve as both introductions to and concentrations of insights gained while teaching, developing technology, and writing about culture. They are supported by rich multimedia that he often produces specifically for a given presentation. He strives to create deep, accessible and entertaining presentations that leave the audience with a sense of empowerment and a desire to express themselves in response to his ideas. 2011 – Science Technology Engineering and Mathematics (STEM) Annual Conference, Maui, HI: Keynote Address. 2004 – Landor Associates, San Francisco, CA. Guest artist lecture on remixing and appropriation in the context of digital media and networks. 2000 – The 2000 World Expo, Cyberspace: Salusa Segundus, a live, remotely-delivered DJ set that served as the de-facto US representation at the expo. Much of Goldberg’s production experience has also been applied in the academic context. He has taught practical production of digital media in all forms: still and time-based 2D and 3D, as well as video and audio production, programming, web and user interface design, and information architecture. He has also taught from a more conceptual and philosophical approach, leveraging his extensive practical knowledge of digital media and Hip-hop. Recent teaching efforts have been focused on creating highly accessible introductions to cultural and visual criticism for the general public. Honolulu Academy of Art (now Honolulu Museum of Art), Honolulu, HI. • 2010-present, Visual Criticism: an investigation of the challenges and opportunities faced by contemporary Hawai‘i, carried out through a mix of introductory critical theory and art-making. University of Hawai‘i at Mānoa, Honolulu, HI. • 2006-present: Department of American Studies, undergraduate level. Popular Culture: A cultural-studies focused look at social, marketing and technological power as it is exercised by branding and marketing corporations in contemporary culture. Digital America: A non-linear “survey” of virtuality, or the transformation of American cultural institutions and practices under the impact of digital technologies. Hip-Hop America: A production oriented course in the fundamentals of Hip-hop that not only outlines the orthodox history of the culture but looks to the effects of global networks on its future evolution. Film in American History: A course that hypothesizes that there is only one cinematic algorithm in contemporary American culture that spawns and absorbs “specialized organs” on demand in order to address and respond to various cultural situations; Students build their own films out of other cinematic fragments. • 2006–2008: Art Department, undergraduate level. Expanded Arts (Digital Media) An art-centered approach to exploring digital sound, image, motion and programming. • 2006: Academy for Creative Media, undergraduate level. Intro to Film and New Media. As a required course for the program’s incoming students, course served as an introduction to the general technical and aesthetic issues of film and digital media. Kapiolani Community College, Honolulu, HI. • 2003: Reverb Culture: Dub & Deleuze. Introduced graduate students to the philosophy of Gilles Deleuze through the aesthetics and production strategies of Jamaican dub music. Students created works that embodied ideas from dub and Deleuze. Past, Present and Future Aesthetics of Hip-hop. Introduced undergraduate students to Hip-hop culture from the perspective of media creation; required students to interpret Deleuze’s philosophy and the production strategies of Hip-hop in their own work; featured local practitioners in guest lectures. California College of Arts and Crafts, San Francisco, Oakland, CA. • 2002: Power & Poetics: Scanning the Audiovisual Archive. Co-taught with Prof. Mark Bartlett, undergraduate course explored the integration of sound, vision and thought in various media using the work of Derek Jarman, Gertrude Stein, Alvin Lucier and Antonin Artaud (partial list). My section focused on Jamaican Soundclashes, the voice in Hip-hop culture, Hip-hop audio production strategies, and the science of dub music. • 2004: CCA Live. Co-taught with Bay Area performance artist Lynne Kirby. The undergraduate class introduced art students to studying the Gesture (the fully-conscious art-making action) and the Glitch (the serendipitous or utterly catastrophic moment in art practice) in the context of improvisation and live production. Goldberg works across multiple media, in various contexts that include classrooms, museums, recording studios and galleries. His projects are most often collaborative in nature, connecting diverse disciplines and communities. They reflect a dedication to the use of digital technologies in educational contexts and using them in such a way that the production of culture is given priority. Generally, curriculum development has presented him with challenging and rewarding opportunities to teach, write, program, design and lecture–often at the same time. Seeing The Value Card Game and Lecture Series (2010–present) University of Hawai‘i Center for Biographical Research, Honolulu, HI. Inspired by the book: The Value of Hawai‘i: Knowing the Past, Shaping the Future (eds. Howe and Osorio), Seeing the Value is a collectible card game and online production application designed to encourage consideration and discussion of the many challenges and opportunities that Hawai‘i faces in the 21st century, such as homelessness, indigenous Hawaiian rights, sustainable agriculture, ecology, energy, tourism, public education and domestic violence. Designed the card game, produced lesson plans, carried out teacher training, lectured students who worked on creating the cards. http://tvoh.manoa.hawaii.edu/ (Documentation available upon request). Creativity Academies (2009–2012) Honolulu, HI. Creativity Academies is a pioneering effort between Hawai‘i creative industries, the state Department of Education, the state economic development agency and Kapiolani Community College to develop an integrated curriculum in art, physics and digital production for high and middle school students. I am a project manager whose responsibilities include curriculum development oversight, management of various committees, teacher training oversight and evangelism. Created a range of lesson plans and curiculum guide. Documentation available upon request. Zebra Crossing: Tbilisi Edition (2010) Artisterium 2.0, Tbilisi, Republic of Georgia. Localized the images and sounds of the San Diego edition in collaboration with undergraduate art students from Tbilisi. Project was recognized by local and international media, as well as cultural representatives from Georgian and U.S. diplomatic organizations. (Documentation available upon request). Zebra Crossing (two versions 2010) New Children’s Museum, San Diego, CA. If a zebra's stripes are meant to protect it from predators while moving in the herd, how might youth be using similar tactics to their advantage and disadvantage? In a society that promotes individuality, what role does cultural camouflage play? These questions are based on the years of youth-oriented projects that Goldberg and collaborator Julio Morales have participated in separately and in collaboration, and are also a reference to the "Voight-Kampf" interrogation test used in the movie "Blade Runner" to distinguish real humans from artificial ones. Zebra Crossing is an installation based around a data projector, touchscreen computer and a professional CD DJ mixing console. Goldberg programmed a MAX/MSP patch that allows users to explore an archive of video clips that reflect on the questions outlined above, and create live video effects based on the sounds selected for playback on the CD players. (Documentation available upon request). Energy Literacy Through Video Game Development (2008) Kapolei High School, Kapolei, HI. Developed and implemented an “energy awareness” curriculum for the science academy at Kapolei High for 140 students. Working closely with experts in renewable energy, the school principle and teachers, course enhanced their existing science curriculum by the use of MIT’s “Scratch,” a visual programming and interactive storytelling development tool. Students made video games that taught players the science behind their various energy and ecology-related focus groups. (Teaching resources and student work samples available upon request). Calvino: An Invisible City (2007) California College of the Arts Pre-college Program, Oakland, CA. Designed and taught curriculum for the four-week, all-day community arts track. Using a multidisciplinary approach including film and cultural studies, field trips into various San Francisco communities, digital photography (Adobe Photoshop), digital 3D modeling (Google Sketchup) and art installation, students invented an “invisible city” they called Calvino – after the writer and theorist Italo Calvino. Students studied and represented all of the dynamics of community interaction: architecture, history, economics, ethnography, geography, etc. They produced an immersive gallery installation featuring digital imagery, drawing, collage, video, sound and constructions. (Teaching resources and student work samples available upon request). MetroHAWAI‘I: Visual Investigations (2006) Palama Settlement In-Community Treatment Program, Honolulu, HI. Students photographed Honolulu’s Chinatown and created a shared archive of images. Working individually and in teams, they took fragments of this visual micro-culture and created digital composites. Working with multiple disparate elements and in multiple layers allowed them to explore ideas of change, insider-outsider status, conflict, and difference. This course also included organizing lectures for the students by visiting presenters. The Urban Construct Deck 1.0 (2002–2003) The B.A.Y. Fund. Co-taught youth with Los Angeles community artist Mike Blockstein. Photoshop and digital photography instruction; students created a fully functioning divination card deck based on photographic investigations of San Francisco, CA that yielded archetypal images. This work was part of the practical investigations for my master’s thesis project at CCA. (Teaching resources and student work samples available upon request). Extreme Theory of Knowledge: Reading the City as Text (2002) French American International School, San Francisco, CA. Curriculum developed as part of master’s thesis research. The course is a collaborative experiment in curriculum development based around having students investigate the city as a semiological field through music, readings, films, bodily experience and discussion. Liminal and Middle Passages (2003) African American Art and Culture Center, San Francisco, CA. Curated lectures and accompanying poster art gallery show featuring Sirida Srisombati, André Williams and myself. Talks and work addressed issues of race and culture through three lenses of technology: pirating media in Thailand (Srisombati,) ontologies of network surveillance (Williams,) and the cultural effects of motion capture technologies on African Americans (Goldberg). (Documentation available upon request). The Future of the City (2003) Enola Maxwell Middle School, San Francisco, CA. This semester-long workshop encouraged participating students to imagine the future of San Francisco through a wide range of drawing, storyboarding, photography, and writing exercises. Students had to consider processes of development and decay, the evolution of infrastructure, the role of law enforcement, the role of life forms from trees to microbes. (Teaching resources and student work samples available upon request). Tactics of Reassembly (2002) Viology at Galeria de La Raza, San Francisco, CA. Collaborative video installation about informal economies in Tijuana. With Julio Morales for group exhibition. Faux City (2001-2002) Co-Lab: New Collaborations Between Artists and Youth, San Francisco, CA. In collaboration with artist Tana Johnson, worked with group of local youth to develop Faux City, a project where students photo-documented their neighborhoods and then used digital imaging technologies to create a new, photorealistic narrative for them. Work was displayed as part of an exhibition at San Francisco, CA State University. 99 Actions (2000) INSITE 2000, San Diego/Tijuana, Mexico, US. Sound design for a collaborative installation with DeMo, Julio Morales and Armando Rascon. CODE 33 (1999) Oakland, CA. Sound design and lowrider choreography for a collaborative public art project and installation with Suzanne Lacy and Unique Holland. Radical Object Oriented Tracking System (ROOTS) (1998) ZEUM, San Francisco, CA. “In collaboration with a SF high school student named Thea Ildefonso. Mentorship, interface design and programming for a fictional INS database from the future. The user navigates a library of sound samples, images, email fragments and bureaucratic notes, unraveling a plot involving government experimentation on Ms. Ildefonso's grandfather. The project integrated Ms. Ildefonso's actual family history (including audiovisual footage) into a project intended to move new media narratives away from "fantasy point-and-click" and into a more ambiguous area that more directly (and critically) addresses the experience and use of technology. Worlds In Collision Website, Curriculum and CD-ROM (1994-1995) San Francisco, CA. Designed and implemented the Worlds In Collision Web Site and CD-ROM, a prototype electronic hypertextbook designed to introduce multicultural theories to high school students through art. Though involved in the content-development process, focused primarily on information architecture, navigation and interface issues. Solutions included "scalable" text complexity for non/limited English proficiency users, multi-lingual options, a student note pad, a searchable glossary and a reliable system for navigating cross-references between different bodies of work on the site. Bucolic Sound Investigations (1987-present) San Francisco, CA. Member of San Francisco-centered experimental sound system collective and record label. Co-produced four independently-released albums (Maximum Access, Justly Styled Universal, Dzyan Blood and The Inner Trip,) several tracks for compilations, remix projects, and performances in live spaces and across networks. Bucolic has been described as “a broadcast from a faulty short-wave transmitter, as the ghost of King Tubby meets 23 Skidoo in the flaking substructure of space station Mir...” Bucolic’s live mix of vintage synthesizers, hand-built equipment, turntables, custom audio software, samplers and instruments has been performed at the San Francisco Museum of Modern Art, Anti-Matter Gallery (San Francisco), The Beta Lounge (San Francisco), The Purple Onion (San Francisco), The North By NorthWest Festival (Portland), and the De Young Museum (San Francisco). Goldberg continues to design websites for a wide range of clientele, focusing on dynamic, community-oriented organizations and individuals–often creatives and activists, but also businesses that work with overlooked infrastructures of modern life such as commercial waste reclamation and specialized scientific analysis. Goldberg is familiar with the entire spectrum of web development but enjoys information architecture, back-end database and user experience design, and social marketing strategies. His “front-to-back” knowledge of the web, from copywriting to design to code and search optimization, represents a rare combination of technical, creative and humanities skills. Funded by the Ford Foundation through the Twenty-First Century Foundation (21CF), this database-driven website is the centerpiece for 21CF’s project that tracks the issues facing Black Men and Boys in various categories of modern life such as Health Issues, Education and Justice. Designed the site for social interaction fueled by rich media experiences and downloadable content. Started a “satellite” strategy that leveraged the technical and search-optimized capacities of existing services such as Wordpress and YouTube but brands the content stored there with the BMB identity. Responsible for site design, database-driven back-end (including integration of a large pre-existing 21CF database) and media encoding. Funded by a Hawai‘i Council for the Humanities grant, HistOracle is an experimental translation of oral history into a format that can best be described as a “self-organizing documentary.” Working with recordings generated by the department of Ethnic Studies at the University of Hawai‘i, I developed an interface that will “reanimate” the recorded voices of a wide range of people who were in one way or another involved in the 1924 sugar strike and massacre on the island of Kauai. Webmaster, content consultant and developer of independent curator and scholar Dr. Lizzetta Lefalle-Collins’ online art and cultural studies “magazine.” Responsible for developing interface, back-end administration and content management tools and numerous database-driven modules for dynamic content generation. Includes a build-it-yourself virtual gallery that registered site members can use to learn about the theory and practice of curation. Developed the website for the Centennial of Filipino presence in the United States. Originally hosted by the Smithsonian Asian Pacific American Program, this curriculum project targeting middle school students, was developed in collaboration with two middle school teachers, two university scholars and a Disney story artist. Responsible for designing the interface and the functional organization of the site’s pedagogical content. Developed a suite of tools for implementing digital versions of exercises found in the class workbooks and curriculum guides, as well as a management and commenting system for teachers using the site. Frequently Goldberg’s web development work creates ongoing relationships with for and non-profit organizations. He consults for individuals and cultural institutions around issues of technical R&D, experimental social interfaces and implementation of difficult or challenging cultural concepts in networked digital formats. He has been exposed to a wide range of organizational types, with management and development experience in educational settings, and a distant but relevant foundation of corporate experience. UserLogic, Inc. (2006–2008) San Francisco, CA. User interface R&D engineer, interactivity design consultant, and database designer. Clients included shopping.com, eBay, Bear Valley Sports, and various Bay Area real estate agents. Landor Associates (2004) San Francisco, CA. After a well-received guest artist lecture, was contracted to contribute to a brand-development project using an approach rooted in indigenous digital practices of remixing, appropriation and sharing–before the rise of social networking and the collapse of Napster. Center for Art and Public Life (2002–2004) California College of the Arts, Oakland, CA. CCA’s interdisciplinary program for integrating arts and community, Developed the Center's digital media infrastructure, a mix of systems engineering and the development of an interactive archive of the Centers media assets to be made available to the staff as well as the community it serves. Also authored several promotional videos, a documentary on the production of the first Tongan tapa cloth produced in the United States, and the original Center website. M/X Entertainment Interactive (2001–2002) San Francisco, CA. Project manager, prototype developer and database designer for interactive DVD projects for Sting and Linkin Park. Balboa High School Communication Arts Academy (1995–1997) San Francisco, CA. Designed and taught the interactive media curriculum using tools like Macromedia Director and related professional digital production software. Also taught theory and aesthetics of user interfaces and digital multimedia presentations. Student work presented at SF Museum of Modern Art, December 1995. French American International School and International High School (Teaching and curriculum development) (1994–2002) San Francisco, CA. Responsible for complete development, implementation and instruction for grades 6-12 new media program. Curriculum included media literacy, media criticism (particularly digital) and interdisciplinary project development individually and in teams. Maintained two computer labs. Designed high school’s “Techno Lounge:" a hybrid space for instruction, independent production and social dynamics, with the creation and critique of media as its atmosphere. Recognized among "Who's Who of America's Teachers" in 1996 and 1999, and was frequently selected for graduation speeches at the middle and high school level. The Exploratorium (1994–1995) San Francisco, CA. Updated digital exhibits with current tools, styles and capacities: The Tree of Life, an exploration of the various phyla of Earth life via the metaphor of a rotatable and zoomable 3D tree; and The Weather Explorer, a pedagogical summary of various weather phenomena. Both projects were purchased by other science museums in the U.S.
SmashTV (1993–2001) San Francisco, CA. Producer, developer, theoretician and instructor for multimedia and networked installations and educational projects grounded in the ideas of participants creating the work themselves instead of spectating. Clients included Siggraph, the California Governor’s Conference on the Arts, the Toronto Interactive Media Festival, the San Jose Computer Museum, the Exploratorium, Zeum, ONE Design Magazine and Working Assets. The After School Kids (ASK) Program (1993) Georgetown University, Washington D.C. Intervention work with youth involved in the D.C. criminal justice system. Technical director and project developer for the Interactive Neighborhoods Project: a multimedia map of Washington D.C. co-produced with program participants (project featured at Siggraph 1993, and lauded by the D.C. Juvenile Court System); and The Ageing Project: an experiment in future autobiography based on digitally aging program participants and asking them to imagine themselves at different stages of life. The Smithsonian Institution Resident Associate’s Program (1992–1993) Washington D.C. Worked in the Resident Associates Program Studio Arts Department on educational outreach project design; Proposed and co-developed Discover Virtual Reality in collaboration with Carnegie Mellon University; Produced event showcasing the special effects of Industrial Light and Magic. Hewlett-Packard Corporation Summer Internships (1990) Research and feasibility studies of warehouse automation by robots (Sunnyvale, CA); CAD work; (1991,1992)–Test protocol development and investigative research on 3D imaging primitives for color laser printers (Boise, ID); (1993) - Extended an existing body of code to accommodate new features for a user interface for ultrasound equipment (Andover, MA).